MONKEYS ARE MY FRIEND: 18! Yes, I've knit more socks! This time, Dan is the (hopefully) happy recipient. That makes a total of 18 pairs of feet-things that I've knit this year! (Sixteen pairs specifically of socks. Two pairs of slippers.) I honestly can't believe I've managed to make so many! 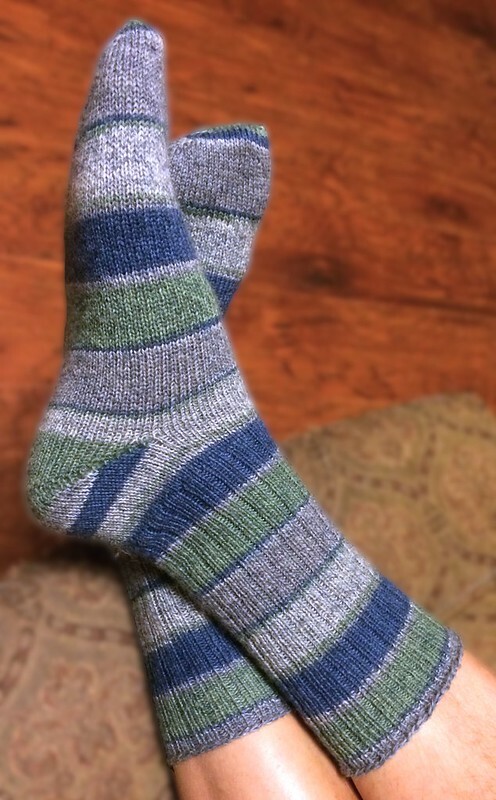 When I signed up for my 12 socks in 2014 Ravelry group, I had hoped I'd finish the challenge with a month or two left of leeway. Now I'm wondering: can I double it to make 24? I'm thinking yes! And, while the picture doesn't show it, these socks are yet another pair with anatomical toes. Yes, anatomical Dan toe socks! Made to exactly match his darling little piggies. Honestly, his toes were easier to shape than mine were so if he decides he likes them, I won't have a problem doing others like this for him. Next up, I really need to work on my qiviut cowl for a bit. And yeah, then I'll probably make some more socks. Gotta make it to 24! You are so talented and my son is so lucky!